***Check out spoiler of latest Hautlook bag! The HauteLook& Nordstrom Summer Beauty Bag is a one off purchase not a subscription. The brands and products that it includes are listed below. 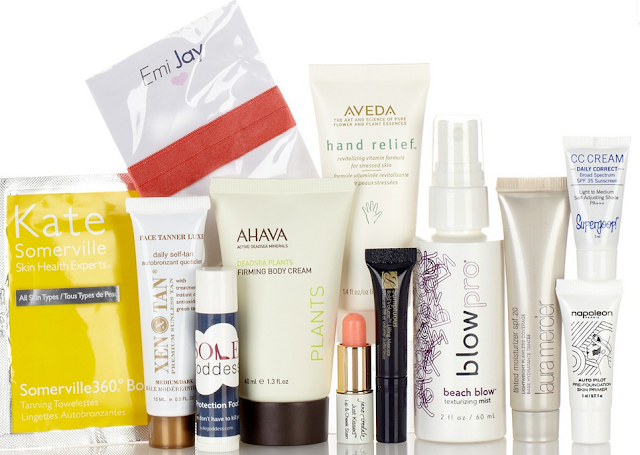 HauteLook has teamed up with Nordstrom to bring you relief to your summer beauty woes. Packed with exclusive summer essentials, this beauty bag is a must-have for your everyday routine and convenient for your traveling needs. Really excited to try this one! Yay I knew this had Sea Salt. I feel so smart! I am the most excited to try this. I saw Julep had one but I didn't want to spend extra to buy it so I am really glad to get this in my box. I seem to get Supergoop in all my boxes:( Its too dark for me. Really needed a firming cream for my neck so I will let you know how this goes. Best smelling hand cream I have ever tried. Seemed to hydrate too. Never thought of a product like this before so that is perfect timing. Not my fav color but I am excited to try this. I love how they don't leave a crease in your hair. Sounds like this might be too dark for me.